E K Dhilip Kumar has been practising Vedic Astrology for the past 14 years. 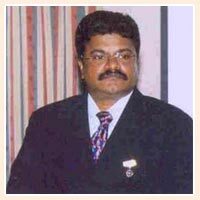 He is a full time astrologer and has completed computer diploma and done his post graduation in Botany. For his insight into astrology he has attained immense glory and has also received awards for body building and for his talent in chess. In the field of astrology, he has attained several achievements and made a number of famous predictions. He honestly admits that it is not possible to predict through astrology, but it can just provide tendencies about life. According to him, astrology is only a sign that can warn people regarding any upcoming dangers.